SUMMARY: Tick-borne encephalitis virus is an important human pathogen in Europe. The infection usually presents as meningitis, meningoencephalitis, or meningoencephalomyelitis and only rarely as symptoms of isolated myeloradiculitis. 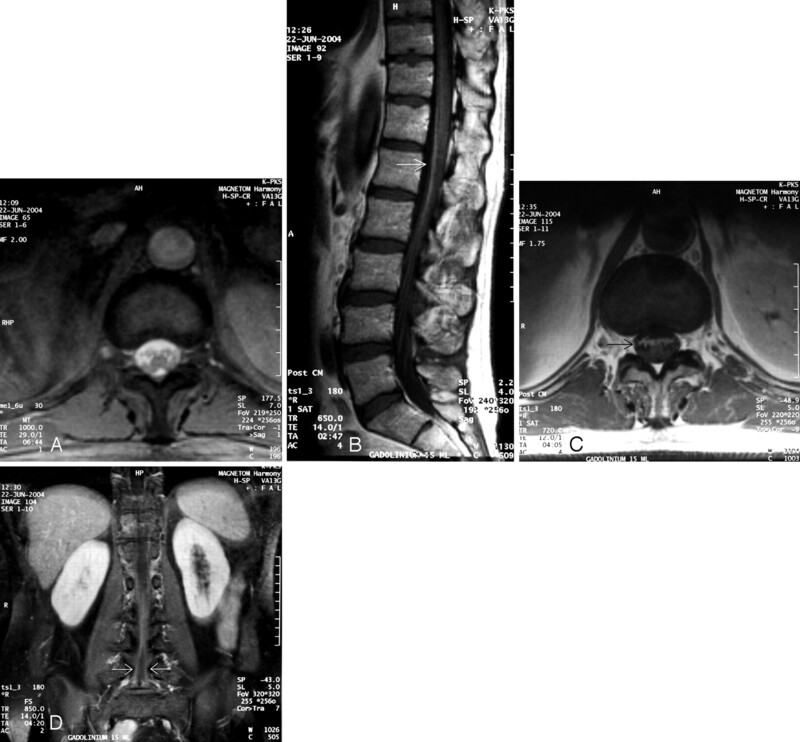 We describe the lumbar MR imaging finding in a 48-year-old man with serologically confirmed tick-borne encephalitis in which there was enhancement of the ventral surface of the conus and the anterior nerve roots from the T12 level extending along the length of the ventral cauda. Tick-borne encephalitis (TBE) is endemic in many parts of central, eastern, and northern Europe, with about 3000 cases reported annually. It is caused by a flavivirus—the tick-borne encephalitis virus, or TBEv—which is transmitted into humans by tick bites. 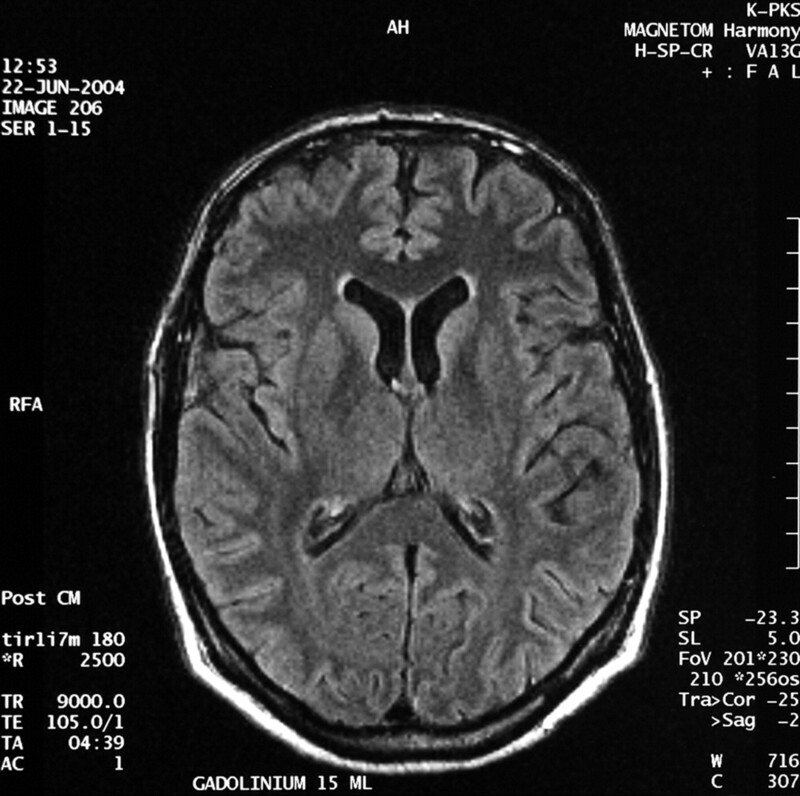 The clinical spectrum of the infection ranges from subclinical infection to meningitis, meningoencephalitis, and meningoencephalomyelitis.1,2 In about 5% of cases, the infection presents as myeloradiculitis without obvious symptoms of meningoencephalitis.3 The diagnosis is made serologically.1,2 The MR imaging finding of the brain may be normal, but the most frequently reported finding is increased signal intensity in the thalami and basal ganglia in T2-weighted and fluid-attenuated inversion recovery (FLAIR) images.1,4–7 To the best of our knowledge, only 2 pathologic spinal MR imaging findings of TBE have been reported in the literature, both of them pertaining to the cervical spinal cord.7,8 We describe the lumbar MR imaging of a 48-year-old man with lumbar radiculitis due to TBE. A 48-year-old man was admitted into hospital in June 2004 with a fever (≤39.5°C) of a few days’ duration, nausea, back pain, and muscle weakness in the legs. He had previously been healthy, with only simvastatin medication for hypercholesterolemia. The back pain had started from the left side but the following day had migrated to the right side. Clinical examination showed the patient to be alert and oriented. No nuchal rigidity was present. Severe motor weakness was detected, particularly in his right lower extremity, and sensory loss was present in the same thigh and calf laterally. The right patellar tendon reflex was absent. Muscle strength in the upper limbs was normal, and only slight clumsiness in the hands was detected. Urine retention and cauda equina syndrome developed, and catheterization was needed. Lumbar CT was normal. Leukocyte count was 10.0 × 109/L, and C-reactive protein was 3 mg/L. CSF contained leukocytes (145 × 106/L), with a granulocyte count of 44%, a protein value of 677 mg/L, and a glucose concentration of 3.6 mmol/L. Electrophysiologic studies were consistent with lower motor neuron damage in the right leg. The patient had received several tick bites while staying at his summer cottage on Kupu Island in the Kokkola Archipelago, western Finland. No erythema migrans had been detected. Because of suspected Lyme borreliosis, intravenous administration of ceftriaxone (4 g × 1) and dexamethasone (5 mg × 4) was initiated. The initial gadolinium-enhanced MR imaging of the brain and the spinal cord was performed at 1.5T the day after admission, but no pathologic findings were seen. Blood and CSF cultures and serological tests for herpes simplex, varicella zoster, mycoplasma, listeria, and toxoplasma were negative. Antibodies to Borrelia burgdorferi also remained repeatedly negative both in the acute phase and at the 2-month follow-up. Instead, a 4-fold titer rise in the antibodies to TBEv (strain Kumlinge) was detected in the hemagglutination inhibition test, and TBEv-IgM antibodies by using the μ-capture IgM technique were positive in both serum and CSF consistent with a recent TBE infection. MR imaging of the brain and the thoracolumbar spine was repeated 2 weeks after admission (1T). The brain MR was normal (Fig 1). On spinal MR images, enhancement of the ventral surface of the conus and the anterior nerve roots was detected, beginning at the level of T12 and extending throughout the length of the ventral cauda equina (Fig 2). At the same time, as part of a large tick-collecting research project, 184 ticks were collected from Kupu Island, and 3 of them were positive for TBEv (A. Jaaskelainen et al, unpublished data, 2005). Gadolinium-enhanced axial 5-mm turbo FLAIR image shows normal basal ganglia and thalami. Axial 7-mm T2* image (A) at the level of conus medullaris shows normal finding. Gadolinium-enhanced 4-mm sagittal (B) and 5-mm axial (C) T1-weighted MR images show enhancement of the anterior nerve roots (arrow) at the level of conus medullaris. Coronal 5-mm T1 fat-saturated image shows enhancement of the nerve roots (arrows) up to level L5 (D). The patient was discharged after 3 weeks of hospitalization with moderate muscle weakness remaining in his right leg. Eleven months after the onset of symptoms, the motor disturbance is slightly improved, but muscle atrophies are still visible and he has constant pain in the right hip. TBE infection is characterized by a biphasic course of the disease in 74% of patients, with nonspecific, influenza-like symptoms in the first phase followed by neurologic infection in 20%–30% of infected patients. In this group of patients, the infection presents as meningitis or meningoencephalitis in 90%. The most frequent neurologic symptoms are impaired consciousness, ataxia, and paresis of the extremities and cranial nerves.1 Myeloradiculitis is usually associated with meningoencephalitis, but it may rarely present as the sole form of the infection. The myeloradiculitic form of TBE, mimicking acute poliomyelitis, has manifested as rapidly progressing motor deficits affecting the arms, cranial nerves, and diaphragm and leading to tetraparesis and respiratory failure. The prognosis of these patients has generally been poor, with permanent pareses and sometimes fatal outcomes.3,7,9 Within the spinal cord, TBEv seems to prefer the cervical spinal cord for an unknown reason.8 Our patient demonstrated lumbar involvement of TBE both clinically and at MR imaging. Consistent with the previous study,4 this patient is one of the northern-most TBE cases reported in Europe. Brain MR imaging may show increased signal intensity on T2-weighted and FLAIR images in the thalami and basal ganglia, cerebellum, hypothalamus, peduncles, and pons.4–:7 T1-weighted pre- and postcontrast images have usually been normal,4,6–:7 but enhancement of a thalamic lesion was described in one patient5 and slight leptomeningeal enhancement around the peduncles in another case.4 Beer et al reported an isolated hyperintense lesion in the anterior part of the cervical cord,8 and Bender et al described a similar cervical finding accompanied by bithalamic and brain stem signal intensity pathology.7 According to histologic studies, TBEv affects predominantly the meninges and the gray matter of the CNS. The basal ganglia, thalami, medulla oblongata, pons, cerebellum, brain stem, and anterior horn cells in the spinal cord are particularly affected.1 The MR imaging findings previously reported and the present finding support histologic studies. Contrast enhancement of cauda equina and nerve roots in MR images is a nonspecific finding and suggests breakdown of the blood-nerve barrier.11 The differential diagnosis of this finding includes Guillain-Barré syndrome, chronic inflammatory demyelinating polyneuropathy, sarcoidosis, lymphoma, meningeal carcinomatosis, AIDS-related cytomegalovirus polyradiculopathy, neuroborreliosis, arachnoiditis, transverse myelitis, spinal cord infarcts, and lumbosacral compression due to disk herniation or stenosis.11–13 This report demonstrates enhancement of the cauda equina and the anterior nerve roots of the conus in TBE, a finding that may be underdiagnosed because spinal MR imaging is not routinely performed for all suspected TBE patients at the initial phase or on follow-up. Because ≤46% of TBE patients have permanent neurologic sequelae, mainly cognitive and neuropsychiatric disorders but also paralysis,2 it is important to recognize this infection. Thus, TBE should be included in the differential diagnosis of enhancement of cauda equina in MR imaging in patients with radiculitic symptoms. Accepted after revision June 22, 2005.